The World Bank Group (WBG) has highlighted climate change as a critical challenge for sustainable development and poverty reduction in the 21st century. As part of its own corporate responsibility efforts, the WBG is taking steps to more accurately measure, reduce, and offset its greenhouse gas emissions (in other words, its “carbon footprint”). The measurement of the carbon footprint from business air travel is crucial, as it constitutes by far the largest part of the institution’s carbon footprint (at least 55%, and perhaps as high as 70%). Current internationally accepted methods used by the WBG for assessing the carbon footprint due to air travel consist of two steps: First, passenger miles flown by WGB staff are calculated, as a share of global flight activity. Secondly, fuel consumption for WBG air travel is taken to be the same share of global airline fuel consumption. This calculation however does not account for systematic differences in footprints per traveled distance by travel class, with higher footprints for premium (business and first) classes than for economy class. This may appear surprising: “A passenger is a passenger”, one might say; travel class shouldn’t matter for how much fuel an aircraft burns. The problem with this argument is that the “footprint” of a passenger on a commercial flight depends more on the space taken up by the passenger in the aircraft, and less on how much the passenger (and her or his luggage) weighs. It is true that aircraft fuel consumption largely depends on aircraft weight. But passenger weight is only a relatively small fraction of total aircraft weigh (15-20%). Also, spacing of passengers is very important for how many passengers can be carried. As a result, with more passengers on a given flight, the “footprint” per passenger drops. The space taken up by an average traveler is larger in premium travel classes than in economy class, in some cases much larger. Two factors are behind this. First, in premium classes seat spacing is more dispersed. Secondly, load factors (the fraction of available seats that are actually occupied) are in most cases lower in premium classes than in economy class. Our calculations show that a business class passenger takes on average up 2.5 – 3 times as much space in an aircraft as an economy class passenger. 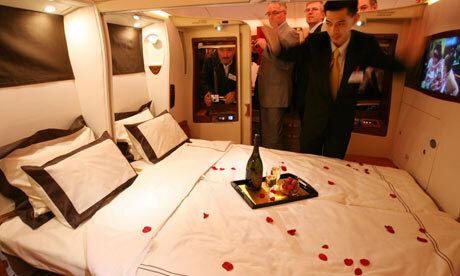 The ratio of first-class to economy-class space occupied per traveler is even higher, in some cases 6 or more. We have recalculated the WBG footprint from data on headquarters-based staff air travel for 2009, based on these premises. Our best assessment is about 225,000 tons CO2, about twice the prevailing estimate, due to the higher “footprint” in business class (64% of all WBG air travel in 2009), and even higher in first class (5% of travel). We have also made some tentative calculations for 2012, and found that this footprint seems to have fallen by about 14%. This reduction is due mainly to two factors: the share of premium-class travel fell from 69 to 66%, and more importantly, first class travel had been virtually eliminated for WBG staff by 2012. The latter reduced the WBG’s air travel carbon footprint by almost 10%. There was also a slight reduction in the overall travel volume of the WBG, by 1-2%. The costs to offset emissions while accounting for the impacts of different travel classes are not very high. To take some examples, for round-trip travel to London or Frankfurt the Bank’s offset cost, at a carbon cost of $25 per ton CO2 (corresponding, perhaps, to estimated long-term damages from emissions but far higher than current offset market prices), would be about $40 in economy class, and about $80 in business class; and for round-trip travel to Delhi, twice this amount. This constitutes only a few (2-3) percent of basic ticket costs. A further step to consider would be to allocate carbon offset payment costs to individual Bank travel budgets, rather than paying them from a central budget as is customary today. This could lead to further awareness on the part of all Bank staff and managers of the carbon footprint of the institution’s air travel. All those free drinks, lie-back seats and extra perks have an unexpected cost that can’t be charged to the company expenses account. First class air passengers are much more damaging to the environment than the average traveler, according to new research. The paper (PDF), published in May, explains that those who enjoy first class service have a carbon footprint that is over nine times larger than the humble passenger crunched up in coach class. First class seats are bigger than the standard berth, meaning less people can get on a plane. This results in more fuel being burnt per person to get the aircraft to its destination. Moreover, passengers flying in luxury are likely to carry more bags, adding more weight to the plane and consuming more fuel. Even a passenger in business class ticket has a carbon footprint that is around three times the size as someone in economy. The figure gets worse if some of the expensive seats are left empty. The research does point out that is doesn’t calculate for the relative weight of passengers between classes, but that’s a more controversial issue. The paper finds that compared with an average passenger a flier in economy class has a carbon footprint of 0.76, a business class traveler has a figure of 2.30 and a first class passenger has a whopping 6.89 figure. A carbon footprint measures an individual’s emissions of the greenhouse gases that are responsible for global warming. The research was carried out by The World Bank, which is attempting to reduce its own carbon emissions, according to Quartz.com. Air travel represents at least 55 per cent of the organization’s carbon footprint and could be as high as 70 per cent, as reported by a World Bank blog. The Washington Post stated that employees at World Bank HQ in Washington made around 189,000 trips in 2009, which clocked up 447 million miles. About 73.6% of those flights were in business class, while another 6.9% were in first class. First class travel has been reduced since, however. Quartz reported that by stopping luxury travel for virtually all employees by 2012 the World Bank has reduced its carbon footprint by around 20,000 tons. The ICAO calculator (used for individuals to calculate their footprints) includes one refinement of standard procedure, by using a factor of 2 for the footprint of premium (business and first) classes relative to economy class. We have gone a step further in this direction by attempting to calculate this factor more precisely than has been done previously in the literature. But more can be done to make such calculations even more precise. One such factor is more precise (flight-specific) information. Everyone knows that flying is carbon-intensive. But the footprint of any trip depends on a host of factors in addition to the simple question of how far you are travelling: the aeroplane model, how many seats are empty, how much luggage passengers carry, the time of day and potentially even whether passengers have emptied their bladders before boarding. Perhaps more important than any of these, however, is the class of travel. That may partly explain why the Foreign Office has just joined the 10:10 climate campaign to cut its emissions by 10% this year and plans to stop its staff travelling business class. As commentators often point out, economy is clearly lower carbon because it maximises the number of passengers that each flight can carry. But how exactly much difference does this make? In the absence of reliable data to help answer this question, I did some sums of my own. Starting with a long-haul scenario, I took a BA 747 floorplan and worked out the area of different blocks of seats, based on the standard length of a 747 being a little over 70 metres. The results of my rough-and-ready study are as follows. Purely in terms of physical space, then, the answer appears to be that flying first class on BA gives you a footprint around 5.5 times larger than that of an economy passenger, with a business seat clocking in at 3.5 times the economy option. For short-haul trips, the differences aren’t so great. As this floorplan shows, first class doesn’t exist on BA’s European flights and the business seats are much smaller than the giant recliners found in the business area of the 747. Roughly speaking, short-haul business class appears to be equivalent to long-haul premium economy, each with a carbon footprint per ticket around 50% larger than standard economy class. There are a few extra factors to consider, however. For one thing, a typical square metre of the densely packed economy section of the plane carries more weight than a square metre of the more sparsely populated first-class and business-class areas. Since extra weight means extra fuel consumption, this should reduce the carbon benefits of economy a little. For this trip, flying business class means spending around 60% more per unit of floor space than you’d pay in economy, while going first class means paying more than 300% extra. It seems fairly obvious that the more you pay for a square metre of cabin, the more profit you give to the airline and the more you subsidise the cheaper classes of tickets. Put another way, if no one flew business or first class, the price of economy travel would have to rise, leading ultimately to lower occupancy rates, fewer flights and less global warming. And there are even more sources of emissions caused by the more expensive tickets: the running of business-class airport lounges and first-class spas; the manufacturing of larger, fancier seats (complete with “crisp white 400–thread Egyptian cotton duvets” in the case of BA first class); and indeed the extra air travel encouraged by the large number of air miles thrown in with many business and first-class tickets. For all these reasons, the difference in carbon footprint between economy travel and the more expensive options is impossible to pin down with any precision. But it’s likely that the climate cost of flying in style will be even greater than the size of your luxury reclining seat might suggest. Posted: Sunday, June 16th, 2013. Filed in Climate Change News, General News, Recent News.